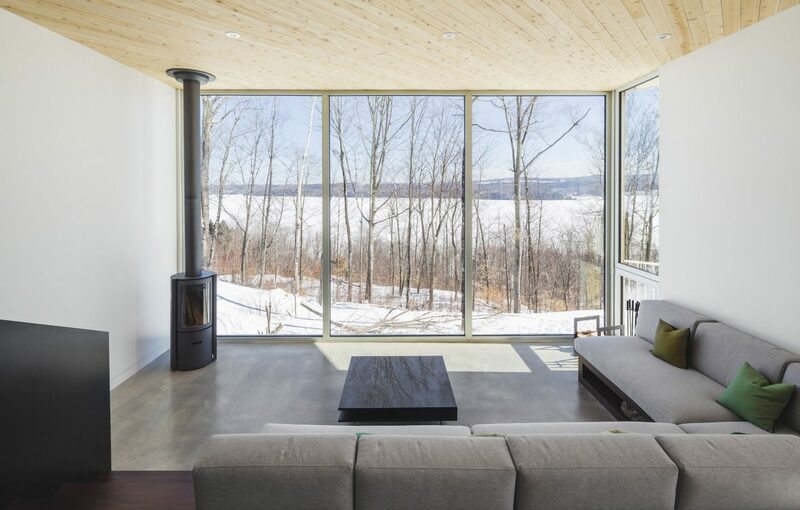 Nestled among the trees along the shores of Lake Memphremagog in the Eastern Townships, this contemporary-style weekend home has been painstakingly designed to blend harmoniously with the nature surrounding it. Its conceptualization by the founding partners of MU Architecture can best be described as organic. At the very least, says architect Jean-Sébastien Herr, the house is in harmony with the topography. The large walnut wood island is big enough for entertaining large groups and for the homeowners to indulge their passion for cooking. The rustic industrial look of the dining table and chairs blends well with the overall look of the house and the concrete floors. During the winter when this contemporary “ski chalet” in Mansonville known as The Nook is primarily in use by a couple with two young children, the white pine used on the exterior, painted white, almost camouflages the house in the snowy terrain. 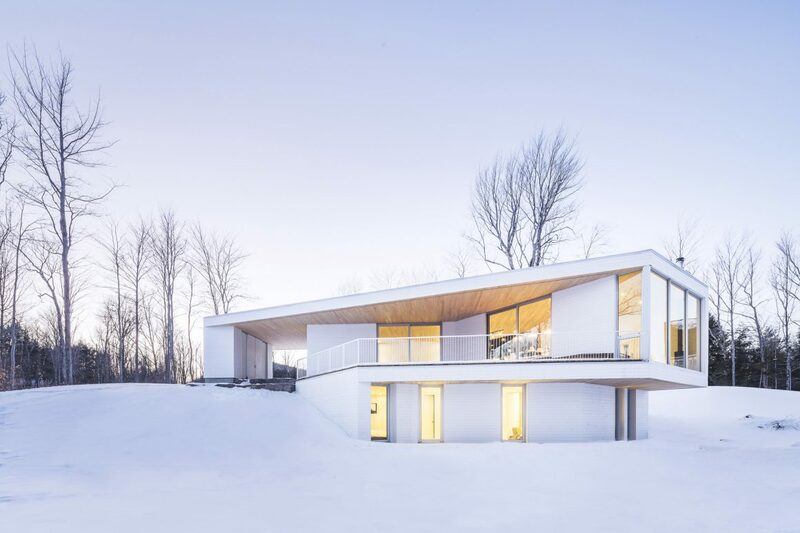 “We wanted it to blend with nature and in winter, it just sort of disappears,” says Herr, explaining that was part of the goal of minimizing the impact of the house on its environment. 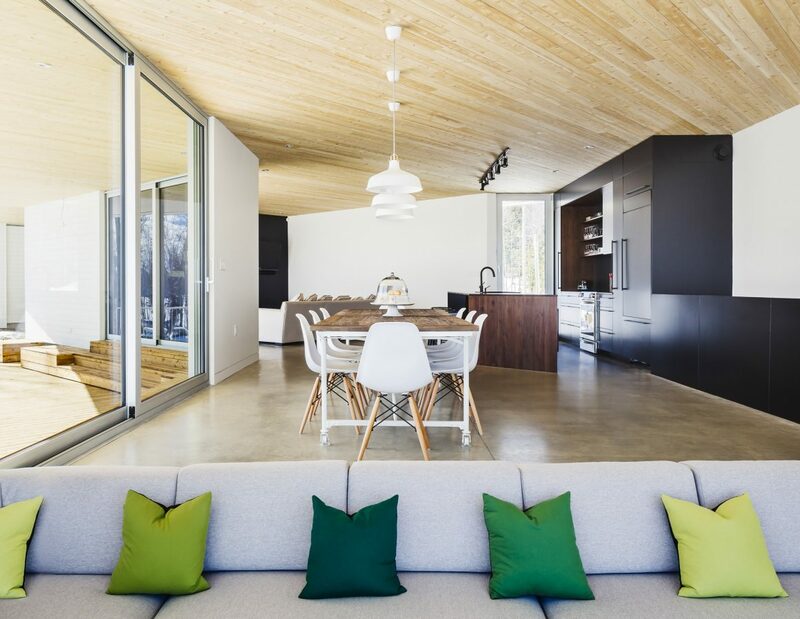 In addition to the concrete base, there were only two materials used on the outside: the pine cladding, and a white cedar roof, which continues into the interior, keeping the design simple and neutral and able to blend with the nature around it. 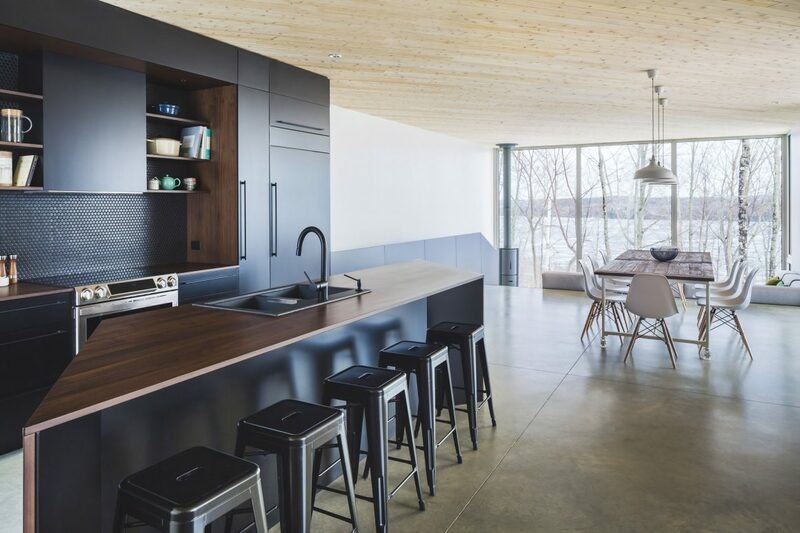 All of that harmonization is well and good – and important to Herr and his partner, Charles Côté, as their firm espouses innovative design, new technologies and an emphasis on green architecture – but it isn’t what really makes this home as spectacular as it is. The angled house – designed that way to ensure privacy – a requirement of the homeowners – is meant to flow like an unfurling ribbon and then, at its very tip, is the reveal of the glorious nook (from which the house gets its moniker). This family room adjacent to the kitchen, with 11-foot-high windows that create a glassed-in corner with an unobstructed view of the surrounding beauty, is like a warm, snuggly cocoon. The nook at the tip of the house boasts unhampered views of the bucolic surroundings and a cozy space with a fireplace and integrated seating area, all of which is designed to benefit from the light that floods the room. With a fireplace and an integrated seating area, the nook is all about the view and the light. It’s comfortable, secluded, and benefits from all the views to the lake. And it has perfect orientation to sunlight, according to Herr. What does that mean? The homeowners get the morning light until noon and the best colours and reflection of the lake, but no direct sunshine, so they’re not blinded by the light. “There aren’t that many windows but the way they are positioned, you are constantly in direct contact with nature,” says Herr. The sharp angles of the house create an interesting dynamic, says architect Jean-Sébastien Herr. It creates movement so the house never feels static. “A series of constraints led to the design but it created a shape that is unique,” he says. The nook also creates a cantilevered area below with a hot tub; it helps define the secluded outdoor terrace where the family likes to spend their days in the summer. The kitchen is the “pivot” point of the house, a corner that joins the main living areas with the stairs to the bedrooms. 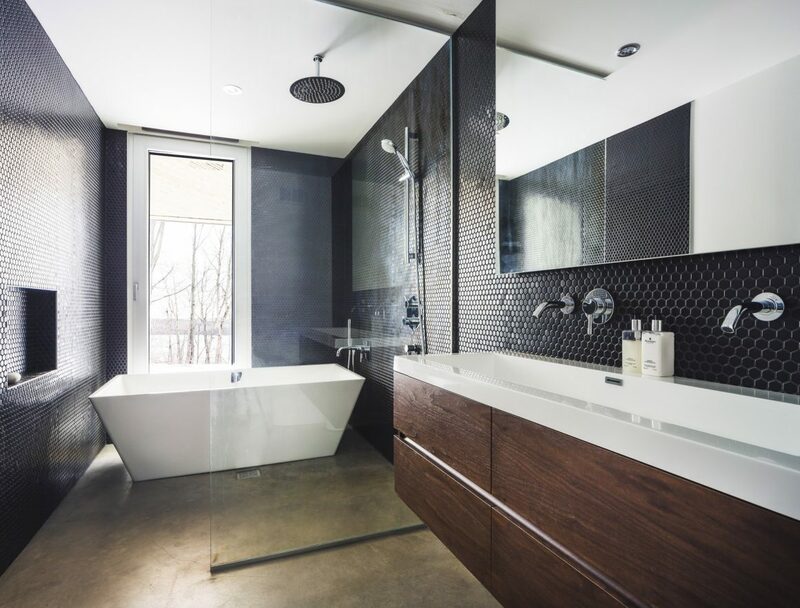 Herr loves the contrast of the dark walnut wood, and black ceramic backsplash, with the rest of the house. The unusual house – which looks smaller than its 3,000 square feet – evolved from the homeowners’ requests. They wanted it to be elegant but simple, easy to maintain, fluid (so very little furniture) and private. The home’s angles were created to ensure privacy but also to exploit the views. 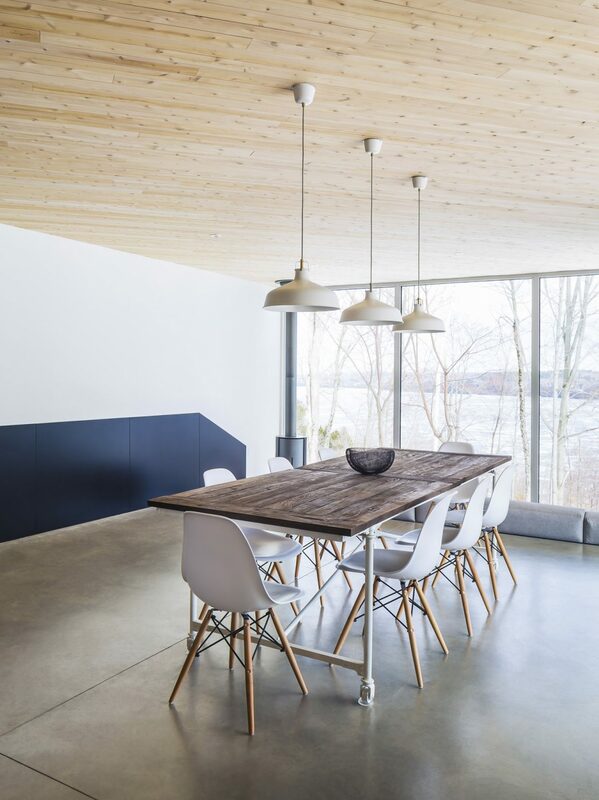 The concrete floor, with its radiant heat throughout, not only reflects the light and contrasts with the warmth of the wood on the ceiling, it is also easy to clean and maintain. 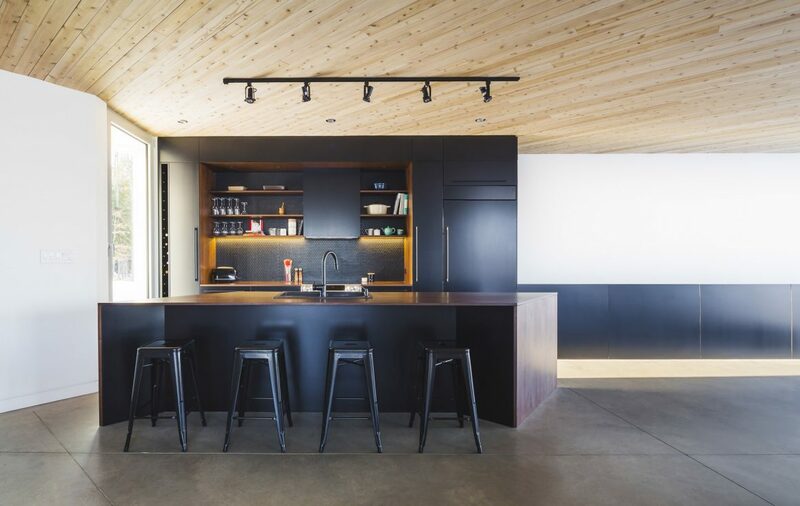 The kitchen provides a bird’s-eye view of the interior and exterior, where the homeowners can watch their children as well as the arrival of visitors through a long window that overlooks the driveway. The kitchen is the “pivot point” of the home, both literally and figuratively. 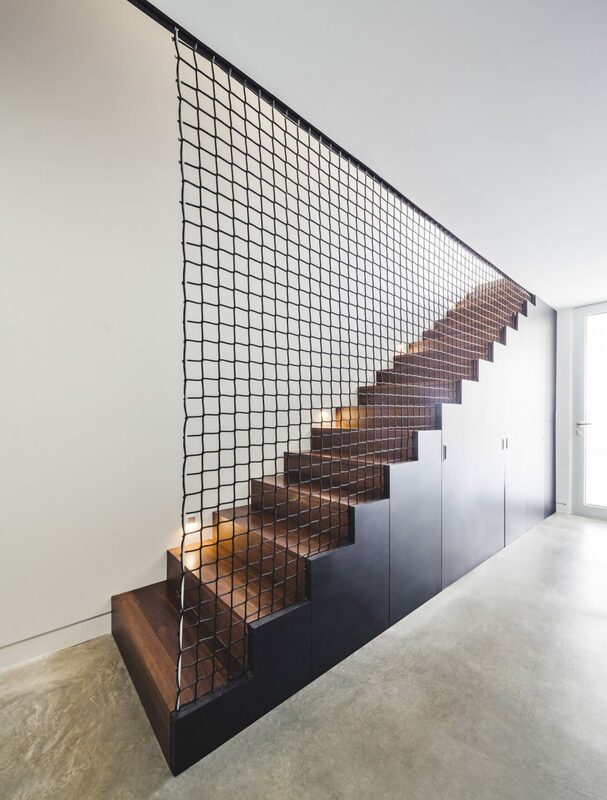 It occupies the space at the corner of the house, leads to the staircase to the downstairs bedrooms, and gives the homeowners, who enjoy cooking, the ability to oversee their children and monitor who is arriving outside. 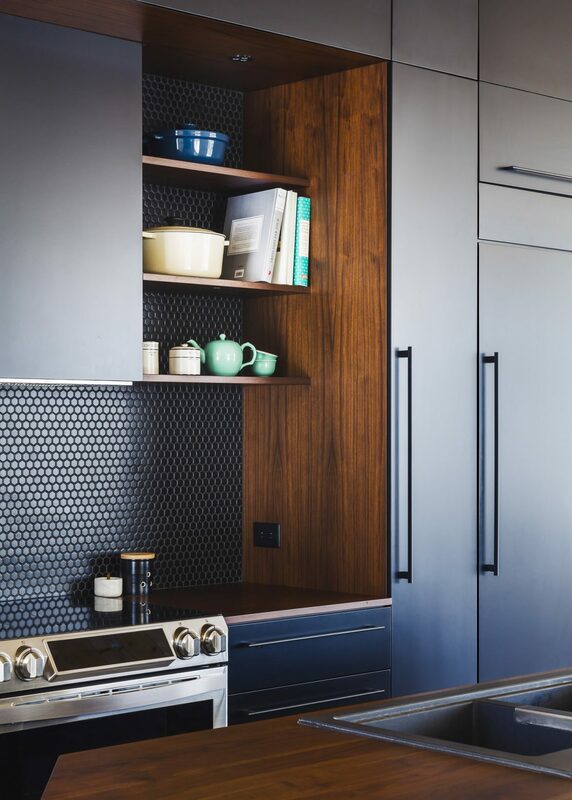 The walnut wood with a black lacquer finish used for the kitchen cabinets provides rich contrast to the pale palette of the rest of the house. The ceramic backsplash is the same tile used in the bathrooms, creating the cohesive look Herr wanted. One of the rooms that is most striking is the children’s bedroom with its floating bunkbeds. As the room had a concrete retaining wall, Herr inserted steel plates into it while pouring the concrete, so the bunkbeds were welded to the wall. 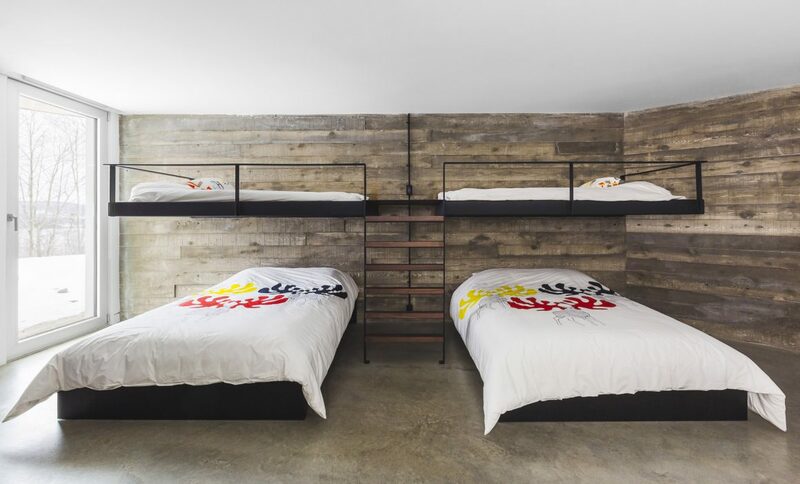 A steel plate inserted into a concrete retaining wall suspends the bunk beds above two double beds in the children’s bedroom. “It is literally like they are floating,” says Herr.